The Sony Cyber-shot DSC-TX30 is a nice departure from the chunky, industrial designs of its peers. It has an ultra-slim metal body, which you can easily slide into the smallest of pockets. Its touchscreen OLED display is one of the best in this class - at least indoors. The TX30 also has a host of useful features that work very well. Unfortunately, it also has some serious flaws. The DSC-TX30 inherits the design from previous T-series models. It's thin, metal, and has a sliding lens cover that you'll either love or hate. The TX30 has one of the longer zoom lenses in its class, covering a range of 26-130mm. As with most of its peers, the lens is fairly 'slow', with a maximum aperture range of F3.5-4.8. You need to watch where you place your fingers, as they can easily end up blocking the lens and ending up in your photos. A pair of LED lamps surrounding the lens can be used to illuminate your subject when taking extreme close-ups. To the left of the lens is one of the weakest flashes you'll find on a rugged camera, with a range of just 0.8 meters at wide-angle (at ISO 400). It may not look like one, but the DSC-TX30 has specs comparable to its bulkier competitors. It's waterproof to 10 meters, shockproof from 1.5 meters, freezeproof to -10C, and dustproof. We didn't freeze it or drop it on the ground, but it handled a few dips in the ocean and swimming pool without a leak. On the back of the camera is a large widescreen 3.3-inch OLED display. The screen has nearly 1.3 million dots (though you can only take advantage of all those pixels when viewing images at 16:9), with vibrant colors and a wide-viewing angle. Its touch-enabled, which allows you to tap the subject on which you wish to focus swipe through photos like on your smartphone. The 16:9 aspect ratio is very nice for recording movies, but when you're taking 4:3 stills (which is the default), you'll have margins on both sides of the image. That's about where the good news about the TX30's display ends. It is quite difficult to see outdoors and underwater, though cranking the brightness to the highest setting makes it tolerable. Speaking of underwater, the capacitive touchscreen cannot be used when its wet, which means that this camera is not suited for snorkeling or diving. If Sony had a pressure-sensitive display or provided physical controls, this wouldn't have been an issue. The display is also a magnet for scratches. Our review unit got several noticeable scratches in regular use, and consumers have echoed that sentiment, as well. If there's one area in which the Cyber-shot DSC-TX30 doesn't disappoint, its features. The camera has a pair of Auto modes, both of which will select a scene for you. The Superior Auto shooting mode goes a step further, and will automatically use the multi-shot HDR or Hand-held Twilight features when necessary. If you'd rather choose those manually, you'll find them in the Scene Mode menu. The HDR feature is especially nice, as it improves the overall contrast of an image, without the need for a tripod. As you'd expect, the TX30 also has numerous special effects to apply to your photos. Sony was the originator of the 'Sweep Panorama' feature, and it continues to be the best one out there. It works very well, with no noticeable seams or 'duplicate people'. One issue we did run into is vertical banding, but only in the 'high resolution' mode. A big omission on the DSC-TX30 is a GPS receiver. Essentially all of its similarly priced competitors have one, which lowers the TX30's value against its peers. The TX30 has the ability to record video at 1080/60i for up to 29 minutes using the AVCHD codec. Sound is recorded in stereo, you can zoom in and out to your heart's content, and the optical image stabilizer will reduce extreme camera shake. Videos look very good, but since they're interlaced, you may see thin horizontal lines when viewing movies, especially on fast-moving subjects. There is plenty of software out there, such as Handbrake, to deinterlace your movies. The TX30 is a snappy performer in most respects. It starts up in about a second, and focuses very quickly in both good and not-so-good light. Shot-to-shot delays are minimal without the flash (about a second), and average with it (3-4 seconds). The TX30 can shoot up to ten photos in a row at either 2.1 or 10 fps. The one weak point is battery life, which is well below average for its class at 250 shots per charge. Sony has been leading the megapixel war for a few years now, so it shouldn't be too surprising that the TX30 has an 18 megapixel sensor. All those pixels on a 1/2.3" sensor isn't going to lead to incredible image quality, and that's the case with the the TX30 - at least when viewed at 100%. If you're not doing that, then you'll find that the TX30 renders color well, exposes accurately, and doesn't clip highlights too often (and if it does, HDR will help). If you do look more closely, you'll find smudged details and mottling in areas of low contrast. It doesn't get a lot worse until you reach ISO 800, after which point things go downhill rapidly. Just to reiterate what we've said throughout this series of reviews, you have to put the image quality results into context. The vast majority of rugged camera buyers won't be viewing photos at 100% on 30-inch monitors, nor will they be making 13x19-inch prints. They'll more likely be sharing photos with friends on Facebook or perhaps making small prints, which makes analyzing image quality at the pixel level somewhat irrelevant. The ultra-thin Cyber-shot DSC-TX30 shows that you can be both stylish and rugged. The camera is responsive, has a beautiful screen (indoors, at least), and has a nice selection of features. Its main problems are mostly related to its display. It's very difficult to see outdoors, scratches easily, and the camera becomes nearly useless underwater, since the capacitive touchscreen does not function. In conclusion, the TX30 is a fine choice if you want a rugged camera that can occasionally get wet. If you're looking to take something into the pool or ocean, you'll want to consider another model. The Cyber-shot DSC-TX30 is an ultra-thin rugged camera for those who don't want to worry about the camera getting a little wet. Underwater enthusiasts should note though that the touchscreen display does not work underwater, and the otherwise beautiful OLED display is also difficult to see outdoors. Photo quality from this stylish compact is decent for its class, but compared to its competitors the main reason to buy a TX30 is that it doesn't look like a tough camera. Those seeking an ultra-thin rugged camera with a fun feature set that can get a little wet. Serious underwater photographers, those taking flash photos or shooting in bright outdoor light. People who want a built-in GPS. There are 32 images in the Sony Cyber-shot DSC-TX30 review samples gallery. Please do not reproduce any of these images on a website or any newsletter / magazine without prior permission (see our copyright page). We make the originals available for private users to download to their own machines for personal examination or printing (in conjunction with this review), we do so in good faith, please don't abuse it. Unless otherwise noted images taken with no particular settings at full resolution. Because our review images are now hosted on the 'galleries' section of dpreview.com, you can enjoy all of the new galleries functionality when browsing these samples. Want to make sure you don't miss out on any future articles? This model is long overdue for a replacement model from Sony. The tiny camera used to be a staple product from Sony. Now? crickets. I've had a Sony T100 (8Mp, similar form factor, NOT waterproof/shock proof) for 7 years this spring. It has been dropped on concrete (+ various other surfaces), and submerged in a pool. Still focuses & exposes properly. I've taken over 20k pictures with it and prefer it to my other cameras for many situations. For anything smaller than 16x20 the detail is sufficient to very good. This new TX30 will take even better pictures.. I love the folded optics, so discrete, and the placement of the lens in the corner means you can actually see the tiny little thing you're taking a macro of. This camera can be pulled from your pocket, concealed in your hand, turned on with your thumb, a sharp, properly exposed and focused image snapped, the camera turned off (again with your thumb) and back in your pocket in less than 5 secs. A great all-around camera for those who hate to carry a camera but like to take pictures. I wish for WiFi, though. Hi, just bought the Sony Cyber-shot TX30 camera and have a problem with the flash of the camera. Tried to take a picture indoor with low lighting and while putting the automatic flash mode, the flash didn't went off. Tried tu put it on forced flash and didn't work either. Any reason why the flash should not work. The camera is brand new and use it less than a month. Is this normal? There is a mistake in this review: "In deeper water, photos suffered from the blue/green cast" ? I believe you missed the fact that one of the Scene modes is specifically called "underwater". You were supposed to engage that mode before taking such pictures. There is no need for photoshop color correction. It's nicely done in-camera. Regarding PQ, the optimal quality is achieved in 10MP jpeg mode. There is no point in recording 18MP jpegs with this sensor. Additionally, the jpeg compression ratio that Sony chose for 18MP files is quite low (it shows in your jpeg samples).
" RE: Sony's PlayMemories Home, the bundled Windows-only software, does not have a color tone adjustment tool." Sony's PMH DOES HAVE a tone curve adjustment tool and the typical features one finds useful for minor edits. The older Sony software for the TX series also had this feature. The older TX10 took some nice panoramas in high-res mode without the banding (not always) so it's surprising to hear it was such a consistent problem with the TX30 and that they hadn't fixed the issue since it first cropped up. Have been using a TX20 a few years now. We have other cameras that can take much better pics, but somehow the TX20 often ends up being the chosen camera. Very small, so is easily pocketed or packed. Life-proofed enough to have some confidence it survives travel, fishing trips, beach, and other trips into the world. Simple enough that it takes little time to get a reasonable setup for whatever shot. And the resulting pics have been great for us. But the TX20 annoyed me in a few things. Long delay for it to decide to record video. Significant delay after starting up to take a pic. Proprietary cable, so one more thing to pack and try and keep track of. 4x optical zoom could be longer. TX30 sounds to have improved in all these. I noted a price drop this week, and by the time I add up 25% more discounts I get, I pulled the trigger on the TX30. No silver color offered in the US? How odd is that? So I chose blue, hope it doesn't heat up in the sun much, and is easily located in dim light. From the comments, sounds like people expect this camera to be all things to all people. In the ruggedized bunch, the Olympus is what I'd go after for really rugged, more options, and better pics. Or maybe the Panasonic. But those others miss the main points for me... be small, be simple, and be likely to survive, while taking decent pics. It is a point n shoot afterall and the main reason we have so many pics using our old TX20 is that it was convenient and in-pocket so often. The new TX30 I expect to be a bit friendlier to me in some ways, in an evolutionary rather than revolutionary way. I have had many of these TX cameras ( TX-5, 4 TX-20's). All have failed. None of them have lasted longer than 18 months. I always buy the ADH policy, which pretty much means that I am leasing the camera for the ~$70 the ADH costs me. I love the cameras except for two things, 1) the screen is useless outdoors. You pretty much have to memorize the screen to use it outdoors, and 2) the lens is in a bad place so lots of shots with fingers in them. But I think I will be moving on to another camera now. I just had one TX-20 replaced, my green one, using the ADH warranty. Then my blue one failed in only 6 months, so it was still covered under the factory warranty. Shipped it to Sony, they said they fixed the "flash" unit circuit, and now after only 2 weeks, it is failing with an over-heating message. I buy these for my kids, so they can have fun. But the failures and poor screen are causing me to consider the Panasonic, plus the TX-30 switched to micro-SD from SD. I think the review may be overly harsh. I have had the TX5 for several years. If you need a slim camera for outdoor adventure use, your options are this and a Casio that is nowhere near as good. The Sony deploys, one-handed, while riding my bike, without looking, in a couple of seconds, from a pouch or pocket. Recently returned from touring in Dordogne, France with the family. Hundreds of on-bike shots and HD video clips that look great on my 2560 x 1440 display. I believe the TX line is the ONLY camera that fits this need well. The criticism about the screen in sunlight is well-taken, but I find it little worse than most. Underwater use? The camera is not intended for underwater use- it has very modest waterproofness. Screen scratching? Not to my experience. And the touchscreen works with thin gloves on. Last thing is this camera is TOUGH. Dropped several times at 15+ MPH to asphalt and rock. Scratched up a bit. Still works like a champ. 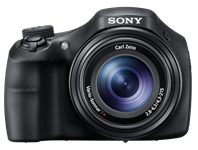 Could you please review the Sony DSC-HX50V? I'm really interested in this camera. Can't believe Sony still has 6400 & 12800 modes. Very deceiving. Maybe a different mode for those two named anti-shake high ISO. But nice constant quality but a tad too much dark shadows. Nice designed cam, crappy sensor!! It did not seem to say about size but it is no larger than 1/2.3" as the picture are pretty bad for anything larger than that!! Not the worse in group, maybe the best, but still bad with nothing more than 10-12mp resolution. But a nice tough cam, but pricey!! Compare the old lady details using Canon sx230hs, Canon has SOO much more detail & is a 12mp sensor. Sony is silly to insist on high resolution sensors when they do not give even 12mp 'real' resolution, a waste of memory on card IMO!! I didn't get... wich size is the sensor? I am a bit surprised by this review and some of the comments too. Some commenters just expect a cadillac of a waterproof cam out of a long-existing niche of inexpensive water-tight P&S. At sub $500 it aint gonna happen! The review itself: a few years ago I went through a slew of cams for beach/pool/ocean trips/waterparks. I owned one of the first underwater Olies, was relatively happy with it, till its battery door broke down. Hence, bought Panasonic TS-2, only to have sand stuck in the power button. Bought and returned several underwater Olies as they were sluggish and less usable than their earlier models. Finally, got a Sony TX5, which has blown everything else in the underwater P&S out of the water: fast, sharp, sweep panorama and IQ overall were all light years ahead of the peers from other brands. Part 2: I too was suspicious at first of the sliding cover, but after several years of abuse, regular trips to the beach, etc., it still works, albeit its black paint has peeled off to display shiny metal on the sliding cover. After a day at the beach I just wash it with faucet water at home, voila! Having looked at this TX30 at a store I personally think Sony again has a big time winner in the category: like the LED's around the lens, and like the quality of shots at ISO1600. I am buying this as soon as my TX5 goes kaput, in fact I can't wait! (I own/ed top notch cams from other categories, so, I'd classify myself as an advanced hobbyist). Another unnecessary disappointment. It really begins to look like a conspiracy, because it is simply hard to believe that among all the World's caera manufacturers there is not one designer capable of understanding what an underwater-capable camera should comprise. Don't they understand that part of the market? Apply all the proper principles, get rid of all the useless crap, and what remains should be an indestructible camera capable of withstanding 10 Atm/Bar, with interchangeable lenses, with IR commands to wirelessly control the lighting accessories, etc. It can be small and coat-pocketable, and it WILL sell. It will be unique like Nikonos III, and usable in the rainy city, in the hospitals, in the depths, on boats, in mines and caves, in ultralight flights etcetera. But no, they simply have to follow the half-chewn solutions of some "experts" who think they think... and we get products that fall short in every aspect, just to fit someone's idea of "pocketability". I think there could be a more capable and serious rugged/underwater camera out there someday. The question remains how much are pro-sumers willing to spend before we enter the realm of professional equiopment and housings for them; replete with their astronomical prices? Personally I would like to see a pro-sumer level camera even if it didn't fit in my bathing suit pocket. Something like an underwater Canon G1X or Sony RX1 or NEX even a Fuji X Pro 1. If one of these were made, it would still be a $3.000 to $4,000 camera. Any takers? The area is very specific and not all designs can be used in building an underwater camera. Cameras in housings are a different kind of thing entirely. But when you consider amphibious cameras (those that can be used by divers the way they're built), bear in mind that these can not be of the variable volume. Thus, no extendable zooms. There should be several interchangeable lenses, so some of the glass can be wide-range zooms, while other lenses can be made for underwater use only. This solves several problems related to the optical characteristcs of u/w lens ports. Dry-land lenses would not have to have any, and u/w short-range zoom lenses can be cased-in behind special ports. Zooms are not of much use in the water. As for the body, properly formed shape alone cancels out a lot of the pressure (convex surfaces, no flat area save the monitor), and all closures should be o-ring sealed. Commands could be magnetic (reed) switches, not push pins. All that does not have to be expensive. As to the article linked in your post, the man is holding a stabilized Canon binoculars that can be bought just about anywhere, and the "mysterious" camera below is an Nikonos RS with a bit of add-ons which does not make it much better than the original RS. Divers have pronounced the RS a flop; this was an outrageously overpriced SLR which was very hard to keep in perfect working order in the field. Besides, ALL SLRs, amphibious or in the housing, were not very practical underwater, except in near ideal light conditions. Thus, refurbishing an Nikonos V casing by adding an articulated monitor in place of the film hatch would make much more sense. So far, it's all just wisful thinking. Typical $100-300 Sony quality - can only be expected to be decent (generous) at 5 megapixel size and pretty good for video. Only the big two really try to have decent image quality in the low price range past few years. Why dpreview reviews crappy camera like this one and doesn't review fantastic cameras like Samsung NX300? Sony should add a phone chip to it.Then it will be a perfect companion to carry.Why Sony should fall behind? We are eagerly waiting for a good camera phone. nice pic, no PP? just out of camera? Only some minor corrections in Picasa3. they should come back to 12 mpix and do something better out of that. Beyond 14 mpix, those sensors get just crappy. Yeah, I finally broke my TX5, unfortunately. The new cameras are just horrible image quality compared to that camera. I'd like to buy another Sony to replace it, but the new cameras are horrible, bought one and returned it. If one do not need a zoom or water resistance capability, one is much better off with the Samsung Note II or the S4 smartphone. The image quality might be even better. I have taken some photos on these devises and they do not disappoint. They can perform quite well just below 0 degrees without fogging. "We've just posted the sixth and final review in our round-up of compact rugged cameras." Neither at the present review, nor at the camera database is listed size of the sensor. Accidental overlooking or a new standard for information? The sturdiness but especially the IQ of all cameras in this class lead me to think they're at best suitable as a gift for my kid to take to the beach or poolside. The IQ seems to be worse than the TX10 in the comparison tool. The higher the ISO, the worse it gets. Compared to the Canon D20, this camera looks soft, lacks detail and has lots of noise/mottling in areas of fine detail. At 6mp less, the D20 shows more detail in the face etching and is cleaner all over. Detail is smeared away in the Sony. This is why it is pointless to put high pixel counts on small sensors. But, hey, the market for which this camera is aimed is not supposed to care. I wonder how a GoPro 3 Black would stack up against these cameras? GoPro stills are rather uncompetitive, especially due to wonky colors, but I am in awe of the video they can produce on such a small device. I've had this camera for a couple of months now, and pretty much just use it when I go to the beach and water parks. For that it's superb. Slip it into your bathing suit pocket and forget it's on you. Photo quality is definitely lacking, but with 18 MP and since I rarely print these types of photos larger than 5 x 7, it works just fine. Color, exposure, and focus is always superb. I love the sliding lens cover. It makes it very easy to get that quick shot. Although the screen is not super easy to see outdoors, I don't have the same problems the reviewers had. Lastly, the touch screen is very responsive. This whole category of camera disappoints me. Just the fact that you have to pull the whole "Deinterlacing" disclaimer on it should have put the 1080/60i video in the "What we Don't like" column. I guess you had to find something positive to say. Conclusion: "They call it a camera". F3.5-4.8, max usable ISO = 80, No RAW, 1080i/60 video that has to be deinterlaced. What is not to like about it? Pretty much everything. Sound of crickets, tumble weed rolls past, dog looks away bored. At least it deserves and got a review, which is more than can be said for the Fuji XP50. Over the past few weeks we've been reviewing this year's collection of weatherproof tough cameras, and in this article we're rounding them up, comparing their relative strengths and weaknesses and taking a more detailed look at how their image quality and feature sets stack up. Even if you've read the full reviews, we recommend clicking through and reading our final, definitive roundup of this year's class of waterproof rugged compacts. Click through for a link. We've just posted the sixth and final review in our round-up of compact rugged cameras. This review is of the Sony Cyber-shot DSC-TX30, which offers a much thinner body than its peers. It also has a large 3.3-inch touchscreen OLED display, a host of fun features, and a 1080/60i movie mode. Next week we'll publish an article comparing all of the cameras, but while you're waiting, check out the TX30 review after the link. Sony has announced the Cyber-shot DSC-WX300, DSC-HX300 and DSC-TX30 compact cameras in the US market. The HX300 is a 20MP 50x superzoom with a 24-1200mm equiv. lens. Meanwhile the WX300 is an 18MP Wi-Fi compact superzoom with a 25-500mm equiv. lens. The tough, waterproof, card-style TX30 offers a 26-130mm equiv zoom. The WX300 will cost around $330, while the HX300 and TX30 will have retail prices of $500 and $350 respectively. Sony has announced the Cyber-shot DSC-WX300, DSC-HX300 and DSC-TX30 compact cameras. The HX300 is a 50x superzoom with a 24-1200mm equivalent lens in front of a 20MP CMOS sensor. Meanwhile the WX300 is a Wi-Fi compact superzoom that Sony says is the slimmest 20x camera. It has an 18MP CMOS chip behind its 25-500mm equiv. lens. Finally, the tough, waterproof card-style TX30 shares the same sensor and offers a 26-130mm equiv zoom. The three models are not currently being announced in the USA.